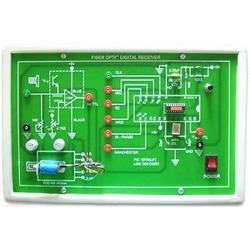 Our product range includes a wide range of digital electronics lab and digital logic trainer. Our reputation in the market is largely attributable to our precision-designed Digital Electronics Lab from our extensive collection of products. These products are manufactured using excellent quality raw material and latest technology by our skilled professionals. In order to ensure quality, these products are stringently tested on various parameters by our experts. Apart from this, remarkable quality and sturdiness increase the demand of our offered range in the market. Our clients can avail this range from us at market leading prices. With desire to cement our reputation in the market, we are engaged in offering an excellent range of Digital Logic Trainer. Keeping in mind current market development, these products are manufactured by our qualified professionals employing premium quality raw material and modernize tools. Apart from this, our quality controllers perform a series of test on the entire range ensuring its flawlessness. Clients can avail the offered products from us at market leading prices. Looking for Digital Electronics Lab ?